This entry was posted in B&W Photography (モノクロ写真), Birds (鳥), Photography (写真) and tagged オシドリのヒナ, ヒナ, baby ducks, birds, ducklings, ducks, 鳥, 幼鳥 by T Ibara Photo. Bookmark the permalink. Wonderful shot. I liked all the pictures. But this so touching. 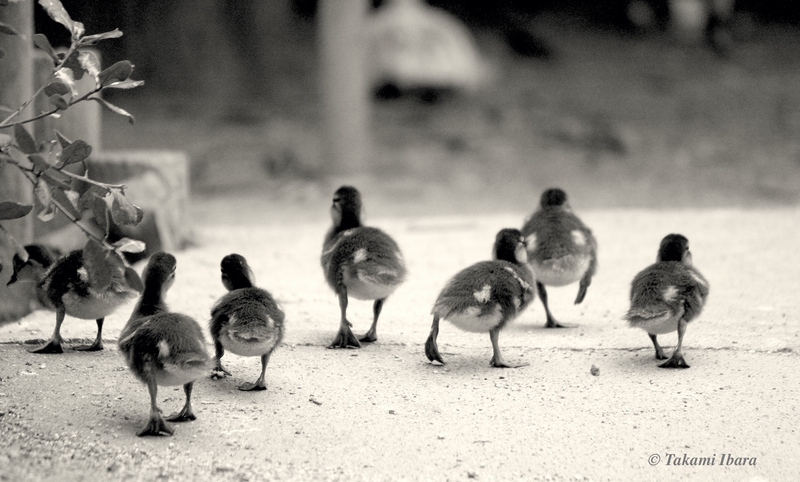 The posture and pose of those great ducklings match the quote so well. Great shot! Hello. Very cool photo. I love it. Ah so lovely and heartwarming! Hello dear Inese ❤ Yes it was a tender moment! I wish for them a safe and long life. I am joining you in your wish. Yes, I can see it 😀 They do look like little soldiers. A small “troop” of ducklings… I hope you’re feeling better. They are cute way to the long road of life. Thank you my friend. I hope they can grow to be adults and live a free life. And thank you for your warm wishes. I am doing well. I hope you are doing good too! Beautiful my friend. And I’m a big fan of the B/W medium. Thanks and to you and yours. This brought a smile to my face! There’s nothing like ducklings, and the angle of the picture is just wonderful! Your photos lighten my life – keep them coming! Thank you Sreejith! I am very happy you could stop by. When I saw this moment, I immediately felt that low angle & monochrome would be perfect. I’m glad you agree 🙂 I hope you are doing great too!